There’s this constant battle to find a balance between content creation and curation. There are over 5,700 tweets per second, 42.6 million WordPress blogs published per month and 4.7 billion Facebook updates daily. It’s fair to say that content is everywhere. With all of the noise that people have to filter through, the least we can do is offer them a helping hand. And in this culture of sharing, we also need to create space for collaboration and giving credit to other’s where it’s due. I’ve been wondering if there is a way to combine the two. How do we collate, actionable content in a single place for our online communities? Content hubs are one option. What is a Content Hub and Why Should I Create One? 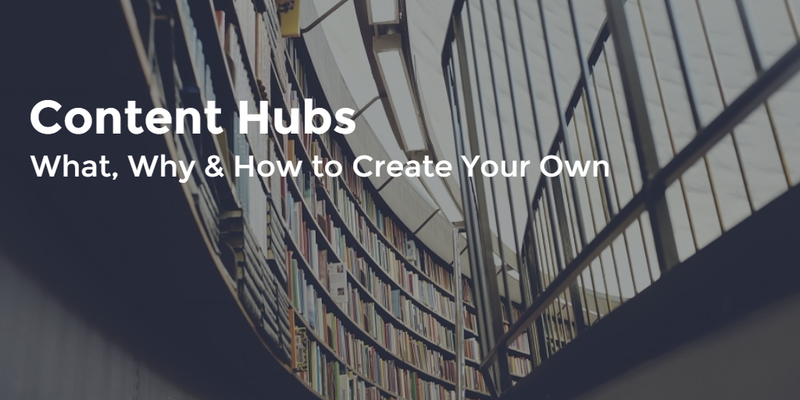 Content hubs are a central point for visitors to explore and discover pieces of content that you’ve collected. They eliminate the element of searching as your website visitors are presented with all the latest on a particular industry or topic in one place. They can contain any type of content, from blog posts to videos, podcasts and imagery. Hubs allow brands to draw a variety of content from numerous sources into a single place and put them in context with a larger idea (industry topic, event, customer issue). Singular types of content like blogs and websites do not qualify as content hubs. It is not just about what you’ve produced. Hubs are a collection from numerous sources. More than anything, hubs are an opportunity to turn posts into conversations. You’re giving people another reason to visit your website by providing them with a service that very few people offer. This is a great opportunity to gain more exposure and develop a brand image that says that you are a center point for the latest industry news and info. How Can I Use Content Hubs? If you have a pretty active online community or a hashtag campaign running, you may want to give them some love and showcase some of their content. This can help you and the community to follow the latest ongoings for your campaign and generates more interest in the brand as on your wall of fame may appeal to people! Podcasts – a great resource if you have a particularly busy body demographic. People can listen to these at their convenience then hit the pause button and pick up where they left off. Hashtag campaigns that are running on several social sites at the same time. Content from people who experts in a particular field. This is a pretty extensive tool with a lot of features. RebelMouse is like a micro website. With it, you can curate content from pretty much every major social media network there is and even embed the hub within your website – here’s the hub that I’ve created. You can import and filter through content from a maximum of 25 feeds. A feed is the content source and can be either a social profile or hashtag. You can connect to Facebook, Twitter, Google+, LinkedIn, Instagram, Pinterest, YouTube and RSS feeds. Thus allowing you to collect a diverse range of content from articles to imagery and videos. Does this sound like it could potentially get a bit noisy? No worries as you have the option of reviewing each feed (to avoid spam) before content is published on your site. In short – there’s very little that you can’t do in terms of curating content with RebelMouse. You also have to option of adding notes to each piece of content that you publish. If you have a strong opinion or would like to share your thoughts on a piece, this is the perfect chance to do so. It can also help to spark conversation amongst your viewers too. Tip: Connect your Google+ profile and RebelMouse will automatically create a section dedicated to it. All of your video content will be stored in one easily accessible place. Paper.li – this is a great tool for collecting content that your Twitter followers have shared. Paper.li presents the best content in an easy to navigate newsletter. You can choose how frequently you paper is published (daily or weekly) and even customize it with your branding. Storify – similarly to RebelMouse, Storify allows you to collect content from the most popular social networks. Select the very best bits to be displayed in either a slideshow or presentation. I’ve found this particularly useful for collecting content from Twitter chats. Bonus – when you share the content it allows you to give people shout outs whenever they’ve featured in your story’s. Tagboard – Tagboard collects all of the content associated with a certain hashtag from Twitter, facebook, Google+, Vine & Flikr. This is perfect if you want to feature content that your community has created. Here’s an example of one that I’ve created. Canva is a graphic design app that gives users access to a number of images, icons, templates and more. Canva Design School is an awesome tool for both professional and newbie designer.s alike There is an endless amount of content to go through, from blogs, tutorials, community examples and teaching materials. Visually provides people with graphic design software that enables them to create everything from infographics to reports, templates and guides. They also have a Community content hub that is a collection of the best work created by designers using their services. Not only does this give designers a chance to show off their skills, it also demonstrates the great quality that can be produced using their program. Win-win for both the company and community. Ideas.TED is a collection of content from articles to galleries that stimulates conversation in a number of areas beyond the realm of the video series of TedTalks. This really does expand on some of the issues addressed during TedTalks and gives people a number of mediums to refer back to. If you take anything from these examples, remember that variety is important. You’re trying to reduce the amount of searching for your viewers. So collecting articles, visuals, videos and podcasts provides them with a diverse range of valuable information. Don’t hesitate to include types of content that you don’t usually create! Over to you: are there any other ways that we can benefit from using content hubs? Are there any other tools or tips that you would like to suggest? Mention them in the comments section – it would be great to hear your ideas!